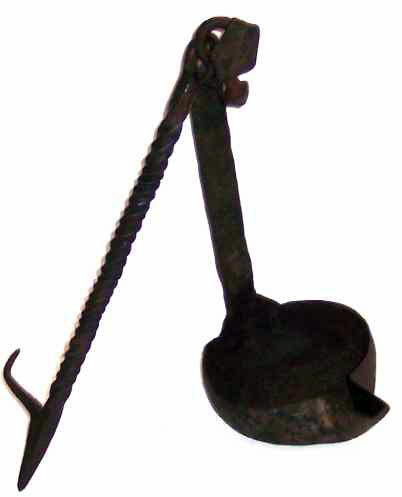 This 17th Century Handwrought Iron Hanging Fat Lamp is rare by age alone. However its unusual and fine massive construction combined with its height of 22" (Including hanger) makes it a true rarity and in a class by itself. The Crusie pan is 4-1/4 wide x 6-3/4" long to the tip of the spout. The lamp itself is 10-3/4" high. A serious collector's piece. Surface is as found with the typical corrosion of its centuries of age. Overall condition is excellent.